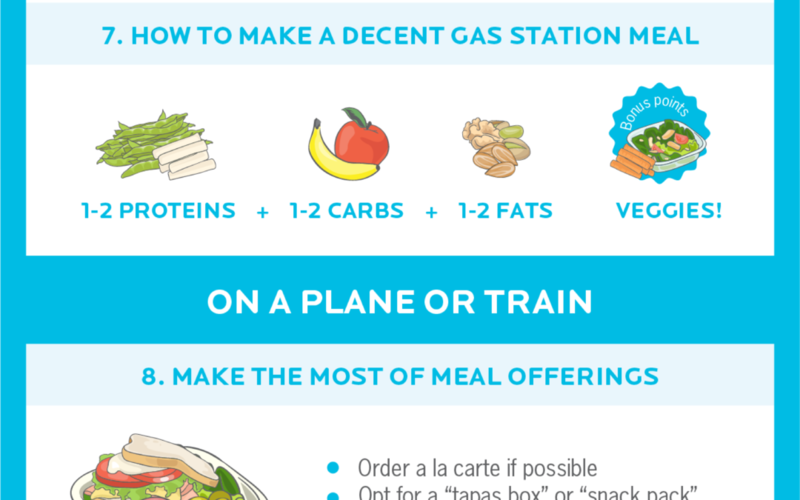 I’ve written previously about how to make healthy eating choices while traveling, but I recently came across a handy infographic that offers up 25 more ways to eat well when you’re on the go. It provides many options, and gives you tons of flexibility and choice. You decide how far you want to take it – anything from making a couple easy swaps and having a certain mindfulness when you’re traveling, all the way to figuring out how to plan all your meals ahead of time. The power and choice is entirely up to you; there’s no right or wrong way for everyone to approach nutrition while traveling. For some, letting themselves relax and enjoy meals they wouldn’t normally indulge in is part of the fun of traveling. But for others, maybe those who are in the midst of making some big life changes and trying to lose weight, having a plan to avoid travel-induced set-backs to their weight loss will benefit them tremendously. So without further ado, here’s the infographic. This came from my friends over at Precision Nutrition, one of my favorite sources for rock-solid nutrition coaching and information.